Wojtek, a brown bear, paraded with his Polish regiment of soldiers through the streets of Glasgow in 1946. Cheering crowds welcomed him and the Poles to Scotland. The bear and the Polish soldiers had arrived in Scotland after having fought against the German army in Italy. Wojtek and his comrades in the 22nd Company, Polish Army Service Corps (Artillery), had taken part in the victory over the Germans at Monte Cassino. Three previous Allied attempts to capture the German held Benedictine monastery at Monte Cassino had failed. The fourth attempt, in May 1944, by General Anders' 2nd Polish Corps succeeded. The cost of victory though was high as 2nd Polish Corps took 4,199 casualties. During that battle Wojtek helped to carry artillery shells from the supply lorries to the company artillery positions. The successful attack opened the road to Rome for Allied Forces and Wojtek had played his part in achieving it. Wojtek was adopted by Polish soldiers as they were travelling from Persia to Palestine in April 1942. They came across a young boy, saw that he was in need of food, so offered him some of their rations. The boy was carrying a sack which moved. The Poles asked him what it contained and found that it was a small black bear cub. They decided to adopt him. They offered the boy some items and a large tin of corned beef for the bear. The boy accepted and the Polish soldiers now had a new companion, a brown bear. They decided to call him Wojtek. Lance Corporal, Peter Prendys, took on the role of Wojtek's guardian. He fed and cared for the young bear. Upon arrival in Scotland Wojtek and his regiment lived in a transit camp before moving to Winfield Camp in the Scottish borders. The British government had set up the Polish Resettlement Corps as a unit designed to help Polish soldiers retrain for civilian life in Britain. Polish soldiers who joined the PRC were housed in camps across Britain. Food rationing was in force in Britain after the war. Keeping Wojtek fed was a challenge for the Polish soldiers as he required the equivalent of 300 apples a day. He did however receive many gifts of food from visitors to the camp at Winfield. Wojtek had a passion for Scottish country dancing. The soldiers of 22nd Company took him with them when they went to dances in Scottish towns on a Saturday night. He loved the music. During 1947 the Polish soldiers at Winfield camp were gradually demobbed. Some emigrated to other countries, others moved to England in search of work. The question arose as to what to do with Wojtek. What was going to happen to him? A decision was finally made that he should go to live in a zoo. On a Saturday morning in November 1947 Peter Prendys unleashed Wojtek from his tether at Winfield camp. The bear climbed into an open truck and left the camp for the last time. The truck headed towards Edinburgh. Over two hours later he arrived at his new home of Edinburgh zoo. The bear walked into his barred enclosure and Peter Prendys left some clothing and an old blanket. On 15 November 1963 Wojtek's life came to an end. He was 22 years of age. Peter Prendys left Scotland for London to find work. He died in 1968. 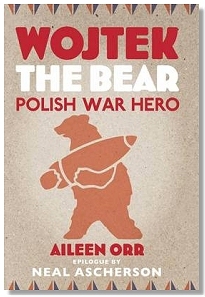 The author, Aileen Orr, first saw Wojtek when she was eight years old on a Sunday School trip to Edinburgh zoo. She says it was love at first sight. Her grandfather, who had visited Winfield camp several times a week, and given treats to Wojtek, taught her the Polish word for hello. She shouted the Polish word at the zoo and Wojtek responded with a wave of his paw. In September 2008 the author launched the Wojtek Memorial Trust. The intention is to raise funds for a memorial statue to Wojtek. The statue will be located in Edinburgh. The Trust would also like memorials to Wojtek to be placed in Poland and at Monte Cassino. Aileen Orr, in the photograph, can be seen reading from her book Wojtek the Bear at the Polish War memorial in Edinburgh on 14 November 2010. At this remembrance service a Memorial to Wojtek the Bear was unveiled. This is a separate memorial to the one the Wojtek Memorial Trust is raising funds for. Publisher - Published by Birlinn Ltd in 2010. This page was added on 30 October 2010. Updated on 03 January 2012.